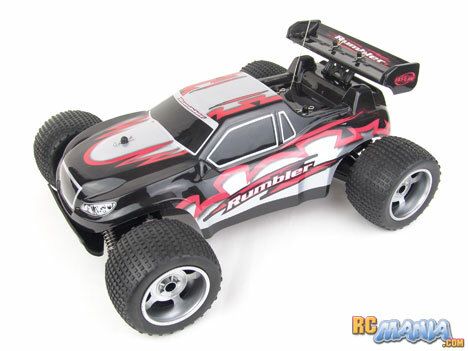 The Fast Lane RC Rumbler is one of the most modern, hobby-level-looking toy-class RCs I've seen in quite awhile. It sports a shiny, thin, lightweight Lexan body that is deceptively impact-resistant. It has four-wheel independent suspension, though as is always the case with these things, the springs are too stiff. The tires are the big winners in the design, with a decent compound and a generous width mixed with a very functional flat pin tread that's good for driving on many types of surfaces. The truck also comes with a 9.6V rechargable battery right in the box, a charger to go with that battery, and even a 9V battery to run the controller. It's truly a complete package! One place where I have to complain, though, is in reference to a sub-title on the box, printed below the "Rumbler" logo on all sides. It says "camion 4x4," Spanish for "4x4 truck." This is not a 4x4 truck. It is a 4x2 -- two (rear) wheel drive -- truck. I'm sure there are more than a few Spanish-speaking people in america who will not be too happy about this misleading packaging. Even as a 4x2, the overall design of the Fast Lane RC Rumbler left me feeling it had some potential, but I've been let down before. Fortunately this one did pretty well in my test runs on the professional RC racetracks at Norcal Hobbies in Union City, California. It was able to get around not only the smaller dirt track at the facility, but also the oversized, National-class 1/8th scale track which has some really huge jumps. The tires had great grip and consistency, and they were soft enough to soak up some of the bumps on the ground that the stiff springs did not. The truck looked and felt poised and under control. It does not have proportional steering or throttle, just on/off, left/right/straight controls, so steering it around sharp corners was an exercise in carefully picking where to start the turn and being careful not to over-correct mistakes. Still, it never felt like I was fighting to keep the truck in the lane, and the more I got used to it, the better I was able to drive it. Though the top speed is modest, it had enough power to get up & over some pretty long, steep inclines that many other RCs I've tested simply could not. Good deal! The Fast Lane Rumbler is a worthy RC toy and I believe it sets the bar for the performance and value that others should aspire to meet or exceed. Its top speed is not amazing, but considering that it's geared towards kids as young as 6, the performance is right in the appropriate range. Th handling over terrain is excellent, though, with well designed tires that shrug off small bumps and gravel while gripping well on hard surfaces and loose dirt alike. The inclusion of a rechargable battery setup and even the 9V you need for the controller really seals the deal and makes the Rumbler a truly good value.